SAL DeTRAGLIA'S VIRTUAL TAPAS BAR: APOCALYPSE TAO. The four horsemen of the apocalypse: Dani, Pablo, Rafa and a beardless Sal. 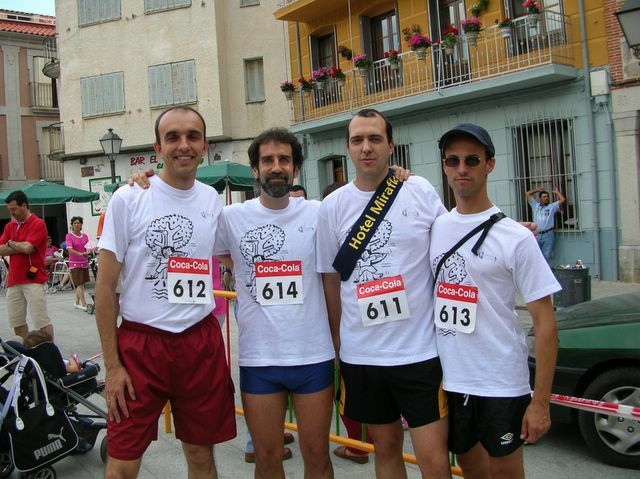 The four graying, balding, elderly men pictured above are a running team known as Fiel al Tao. This team competed in the half-marathon relay race that took place in Miraflores, Spain last weekend. Needless to say, they struck terror in few hearts on the other teams. The race was structured as a relay. Each team member ran a five kilometer course, then passed the baton—which, in this case, was a polyester sash worn Miss America-style across the chest—to the next team member. Sounds easy, but there was an unexpected surprise—the first 2.5 kilometers were all uphill. Given the steepness of the terrain, my time might have improved had I been wearing crampons. But alas, all I had were cramps. Despite many years of library-lounging and alcohol abuse, team Fiel al Tao finished a respectable 39th out of 68 teams. And to those 67 other teams, I’d like to issue the following plea: If anyone stumbled across my pancreas on or around the course’s 2.5 kilometer mark, would you kindly return it? You should run with the bulls. At least you get to drink all night first. PS, you're erudite again. I forget to come here when you're only fun. Yoda! So I am erudite again! I'm still not sure what erudite means, but I like being relegated to that column of your blog. I felt a bit empty when I was previously reclassified me to fun. I mean...once you've been deemed erudite, it's hard to go back. Besides, there are lots of fun people in the world...and many are idiots. But erudite! Yeah! That's for special people. Thanks. And BTW...nobody said I couldn't drink all night before the half-marathon relay. I had the beard at the start of the race. But by the time I reached the top of that bloody 2.5 km hill, I'd pulled it out. Tart roundup? Count me in! Gracias a tu blog aprendo inglés: "relay"=relevo. Gracias, Sal. Sending a nice pancreas via UPS. Good Job!!! !